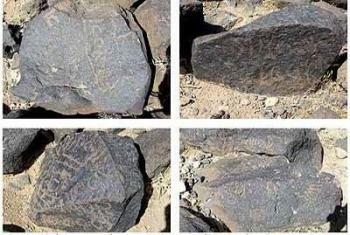 - SYRIE : Al-Zelf - The national archaeological mission working at al-Zelf archeological site in Sweida province unearthed a number of Arabic inscriptions dating back to the Ayyubid and Mamluki periods. The inscriptions included a historic inscription mentioning Palmyra during the reign of the Roman Caesar Hadrian. Other inscriptions referred to the date when Hadrian came to Syria and to the names of some villages such as Sha'af, Is'ana, Busan and Rashida. More than one thousand writings and stone inscriptions and drawings dating back to the second century B.C. were authenticated.The mission also discovered a stone pillar adjecent to the castle's north wall, in addition to an entrance of a lobby leading to a cellar. At Salkhad Castle, pottery fragments of different colors and thickness dating back to the Islamic period were unearthed, in addition to metal arrowheads, bronze coins,some beads and stone tablets with Arabic writings. The national and foreign archaeological missions working at different archaeological sites in Deir Ezzor province discovered antique statues, pottery jars and iron findings. Director of Antiquities and Museums Department in Deir Ezzor Ahmed al-Saleh said that the most important discoveries were a palace from the Umayyad Period and a pottery jar containing a bronze one inside, in addition to some iron keys and door bolts dating back to the Byzantine era. The findings also included a limestone crown and an incomplete camel statue made of fired clay. At Qaber Abu al-Ateek archaeological site, cuneiform inscriptions were unearthed while a Byzantine bath dating back to the sixth century A.D. was uncovered at Tel al-Kesra. - RUSSIE : Stavropol - Archeologists in Stavropol Territory have found evidence that the region was opened up by merchants of the ancient Silk Road. One of latest archeological finds is a bronze mace, which served as a weapon in different tribes. Three Sarmatian burials were found in a barrow that is cleared not far from Pyatigorsk. Besides, the specialists found ceramics, bronze items, and faience ornaments, which were unearthed from a burial place of a teenage girl. The finds are about three thousand years old. According to archeologists, the most interesting of the artifacts are a fragment of a bronze mirror, and beads made of faience – they had been brought there from Egypt. It is another confirmation to the fact that the region of Caucasian Mineral Waters (aka Stavropol Region) was known to merchants on the Silk Road. - INDE : Iddar - A 2ft tall idol of Lakshmi Narayana has been found at Iddar, about 1 km from Poinguinim market. The idol is finely carved and features a shankha, chakra, and gada. It was found buried in mud and covered with weeds. While experts of the state museum or the Archaeological Society of India (ASI) are yet to study the idol, local elders opine that it is at least 200 years old. Local resident Damodar Prabhudessai, 85, claimed the idol was brought to Iddar by another local resident, the late Bala Anant Bhat. Pointing out to the famous mutt of Shree Venkatesh which is about 500 m from Iddar, Prabhudessai claimed that Bhat wished for a similar mutt to be built on his own property. However, he died while work on the mutt was still on, and his family never completed the structure. It subsequently deteriorated with age, though the idol remained within, claimed Prabhudessai. With one Bala Chari later buying the land and having it cleaned, the idol was found. Residents of Poingunim have expressed the desire to build a temple of Shri Lakshmi Narayana at the place. - SYRIE : Jesser al-Shoghor - Archaeological Excavation Department at Idleb Directorate unearthed two archaeological cemeteries to the north east of Jesser al-Shoghor, dating back to the Roman era.Director of Excavation, Anas Haj Zeidan said the excavations uncovered two cemeteries among other mass cemeteries engraved in rocks. The soft rocky structure allows the carving of sarcophagus easily. Each cemetery includes three sarcophagus for burying young children. A pottery vessel with child's bones in addition to some funerary related materials were also unearthed. 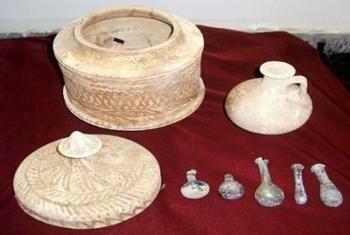 A pottery vessel of 23 cm high and 65 cm in diameters was also found. The vessel's cover is red with floral and geometric paintings. Inside the vessel, five glass vials for kohl with bony instruments, he added. - LIBAN : An excavation team from Kyoto University working in Lebanon has found a lead plate believed to date from between the second and fourth centuries that was apparently used to invoke the spirits of the dead. The 6-cm-wide, 14.7-cm-long plate, discovered near the entrance of an underground grave, is adorned with ancient Greek text that reads "May the unjust be removed from them" and "May signs of a gag and shame, and disgrace be given to them," along with the names of four people, the team said Tuesday.Hiroshima University associate professor Hiroshi Maeno said, "Common people in a weak position may have made a wish for the supernatural to accomplish what they were unable to." - U.S.A. : Homolovi - It’s been a tough year for the 28 sites within the Arizona State Parks system, particularly for the Homolovi Ruins State Park in Winslow, responsible for protecting and safeguarding the 4,000-acre cultural and religious site. The park, originally home to the Hisat’sinom (the “long-ago people,” better known as the Anasazi of the 14th century), and closed since February because of statewide fiscal problems, is now in the final planning phase and about ready to announce a specific reopening date, expected soon. 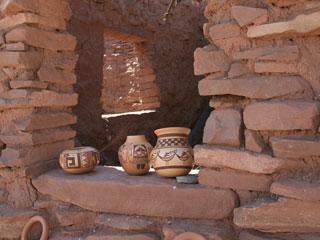 Homolovi, a Hopi word meaning “place of the little hills,” features a cluster of some 300 archaeological sites including several separate pueblo ruins built by various prehistoric peoples from 1250 – 1400 A.D. The park serves as a center of research for tribal migration of that time period and while archaeologists study the area and confer with the Hopi to unravel area history, Arizona State Parks provided an opportunity for visitors to personally experience two of the seven ruins.Most visited is the largest, Homolovi II, an excavated site with about 1,200 rooms, 40 kivas or underground ceremonial chambers, clusters of pit houses, and three large plazas. Petroglyphs can be found along certain sections of the nearby Tsu’vo trail. Many of the early peoples paused their migrations to stay awhile in these high grasslands and find a home along the Little Colorado River, tilling the rich flood plain and sandy slopes before continuing north to join peoples already living on the mesas, peoples known today as the Hopi.The migrations ended when the people settled at the center-of-the-world, the Hopi Mesas north of the park. Today’s Hopi tribal members, referred to as the world’s greatest dry farmers, still consider Homolovi and other Southwestern pre-Columbian sites to be part of their homeland and make pilgrimages to the locations to renew ties with the people of the land. - TURQUIE : Bursa - The body of a man with an arrow tip still lodged in his spine was found during ongoing excavations in Bursa’s Aktopraklık tumulus. Archeologists believe that the man had died shortly after he was shot with an arrow from a bowman on higher ground. 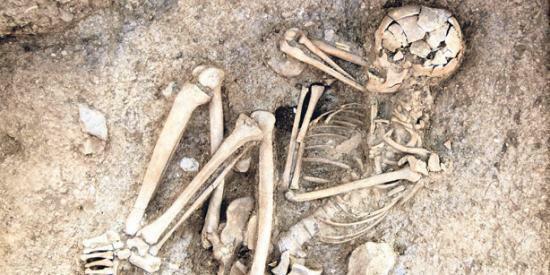 The tumulus where the skeleton was buried is estimated to have a history of about 8,500 years. 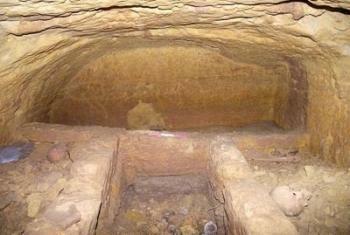 “This tomb of a man in his 30s from the early Chalcolithic period did not seem unusual at first glance. He was buried in accordance with the burial traditions of the period. … On closer examination of the skeleton, we discovered a deep arrow wound in the bottom of his spine,” paleoanthropologist Songül Alpaslan Roodenberg from the excavation team told the Anatolia news agency. “The arrow tip explained the cause of this Aktopraklık man’s death almost precisely,” she said. Roodenberg also noted that the arrow tip was made of flint and it was lodged 12 millimeters into the spine. “It is most likely that the arrow struck his spine and damaged the abdominal aorta, which was located near the path of the arrow. This indicates that the man died shortly after he was injured [via the arrow],” she explained. Adding that it is very probable that the man died quickly due to excessive bleeding, the paleoanthropologist said: “It seems that he was injured not far from the village and was taken back to the village shortly after he died. Otherwise, it would have been impossible for him to be buried in the traditional fetal position. “Although it is hard to tell whether the man was a warrior, hunter or just a peasant, this finding will certainly attract attention in the near future,” she added. Roodenberg also noted that the tumulus, whose history stretches back to about 8,500 years ago, is one of the earliest farming villages. Nearly 60 tombs have been discovered during excavations at the ancient site, which were launched seven years ago with the support of the Bursa Metropolitan Municipality. The tombs are from the Neolithic and Chalcolithic periods.“Rites for burying the dead give us clues about the belief systems of prehistoric people. Details including the shape of the tombs, the way the bodies are positioned or objects buried near the dead reveal much information,” she added. - U.S.A. : Lewes - Delaware archaeologists turned to a Sussex County hospital this week hoping to find some clues surrounding a marine mystery. On Wednesday, radiology staff at Beebe Medical Center X-rayed multiple artifacts pulled from the waters of the Roosevelt Inlet near Lewes. The pieces belong to an unidentified shipwreck about 15 feet below the surface but are too difficult to identify by plain eye. The hope was an X-ray could provide an inside look at artifacts that may help identify the sunken vessel. Initial guesses from experts suggest the ship went down no earlier than 1772 and possibly as late as 1780. Some archaeologists have suggested the items belong to the Severn, a British trade ship that went down in a rare May snow storm in the 1770s. ...full of items, including a cylinder-shaped object believed to be an old piece of medical equipment, possibly a syringe. The problem, the outer shell was so dense even the equipment had trouble penetrating the covering. 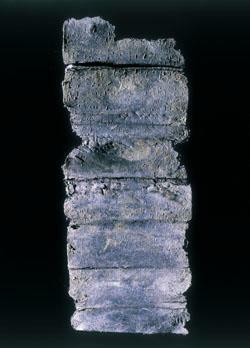 Images of another item, believed to be a piece of wax, showed small metal objects inside similar to safety pins. Stocum quickly noted that the safety pin had not yet been invented at the time of the perceived sinking. - ROYAUME-UNI : York - The discovery of the skeleton of a murdered gladiator underneath a York museum could point to the site of the city’s Roman amphitheatre. Historians believe skeleton of a huge Roman who was stabbed to death and buried only 30cm beneath the foundations of the Yorkshire Museum could be a clue in the search for York’s Roman amphitheatre. Experts have revealed the skeleton, found during the museum’s £2 million refurbishment, is that of a powerful, athletic male who was stabbed at least six times in a fatal attack, including a powerful sword blow to the back of the head. The location where he was found has long been thought to be one of the prime locations for a Roman amphitheatre, which would most certainly have been built when York was the Roman capital of the north. And they believe it is possible that the Roman found could be a disgraced or defeated gladiator who was literally thrown out with the rubbish after his brutal death. The skeleton was found in January by builders carrying out work on the museum, as part of its refit. 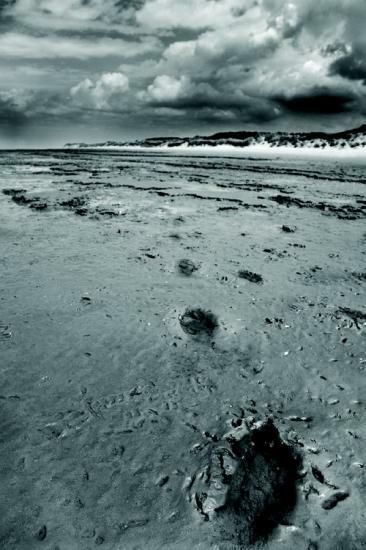 Following analysis by experts from York Osteoarchaeology Ltd, it has been revealed that the skeleton was of a middle aged man, aged between 36 and 45 years. He was very tall for a Roman at 179cm and of muscular build. Lesions in his vertebrae suggest spinal stress, possibly through lifting heavy loads. His arms are well developed and, similar to other gladiators found in Holgate in York earlier this year, bear all the hallmarks of repetitive sword training. The most notable clues on the skeleton are the six blade injuries which, because there are no signs of healing, were delivered at death. It was found in an area which has for a long time puzzled archaeologists as it is in close proximity to the Roman Fortress, on what was a very flat expanse of ground Because it is also a key medieval site, the precinct of St Mary’s Abbey, excavation has been limited so the Museum Gardens remains one of the few untouched areas in the city that may have been large enough to house the amphitheatre.